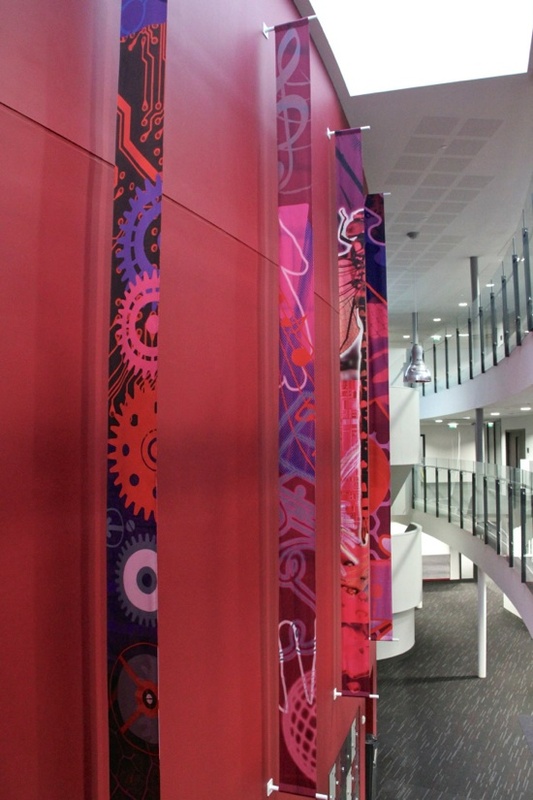 The atrium banners were installed today at Kettering Buccleuch Academy ( KBA). The academy is due to be handed over next week so these were one of the last things in. A team from Service Graphics put them up in double quick time using a scissor lift and some hard graft. The banners are similar to the larger banners in the Block Wings although these ones only measure 300mm wide by 6 metres high. 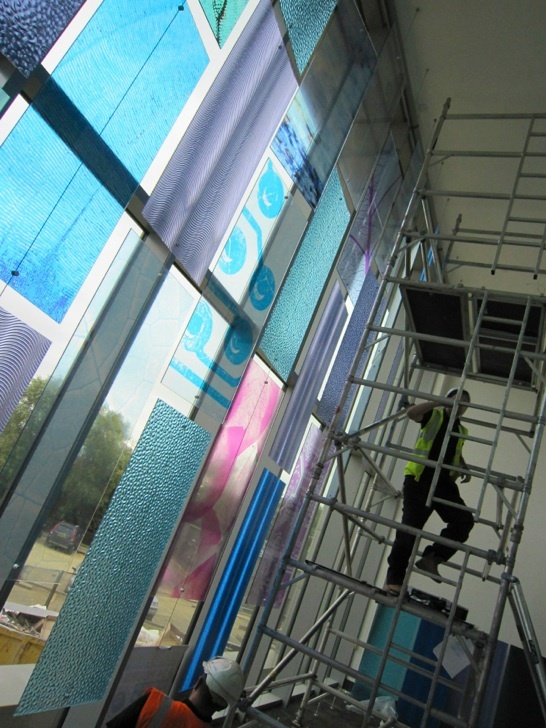 The first of the suspended resin screens was installed this week at KBA. 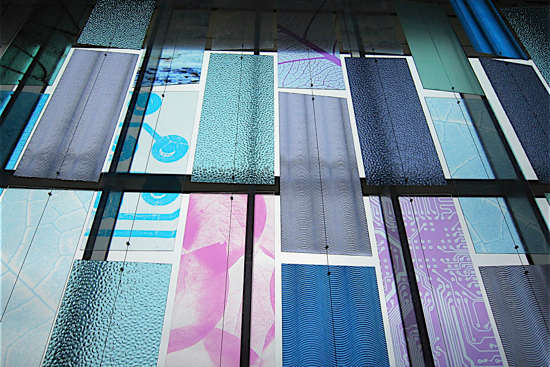 Each panel measures W600 x H1500 x 6mm suspended on 3mm cables from floor to ceiling. 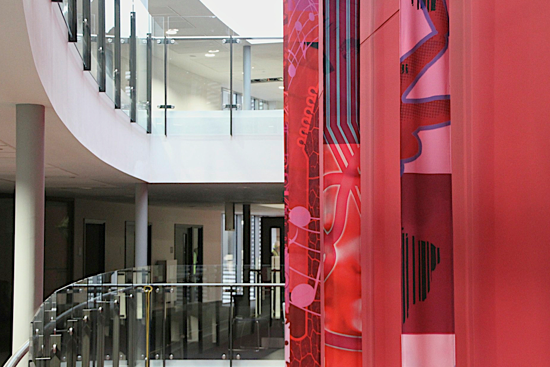 The whole assembly is over 9 metres wide by 6.5 metres high – very impressive when you see it close up. 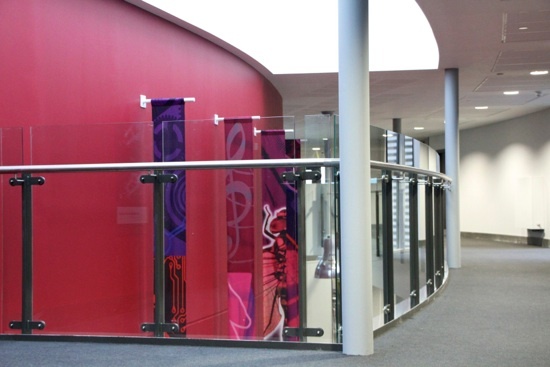 The panels themselves are a mixture of either 3Form resin panels with various textures and interleaved colours or clear acrylic panels with optically clear printed film applied to one side. 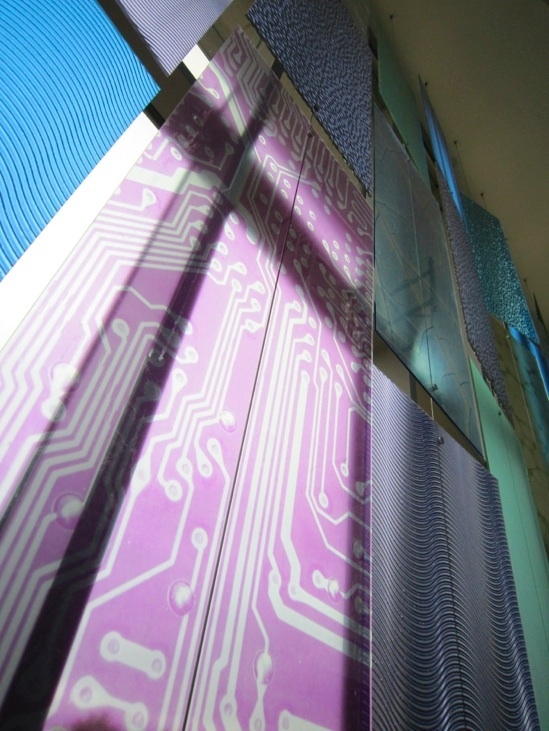 When the sun light catches the panels the whole room is suffused with glowing squares of colour. Quite spectacular. 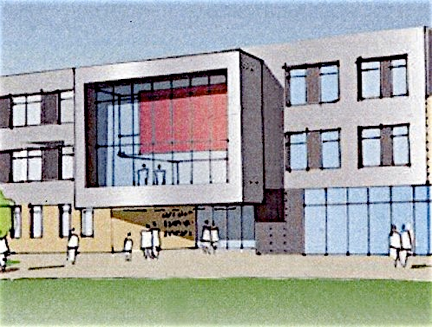 The screen has been installed over the main High school entrance and a second screen with different artwork will be located at the Primary school entrance. That screen won’t be installed till later on in October close to the completion of the scheme and hand over to the school. 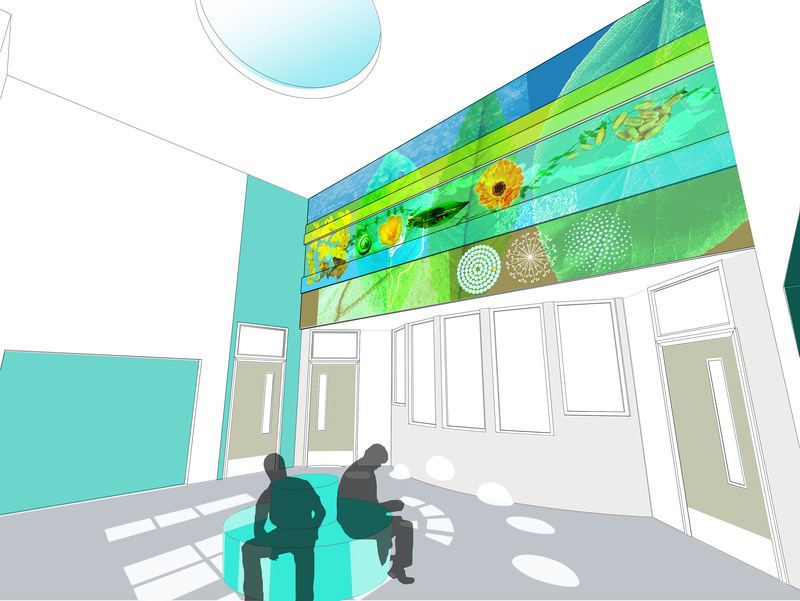 We’re pleased to announce that we’ve been commissioned by the United Learning Trust to deliver the public art elements for the Kettering Buccleuch Academy working with Willmott Dixon Construction and Nicholas Hare Architects. Work has already started on site with the steel frame nearly completed. 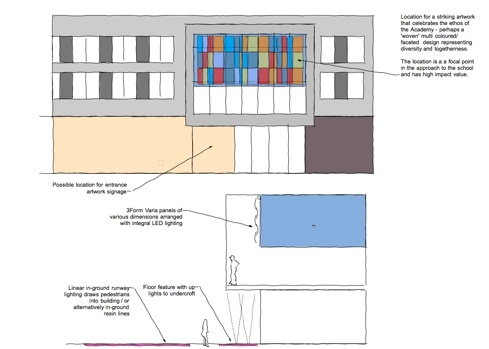 Our role will be to engage with students to develop ideas for some key areas of the academy including the atrium wall wrapping around the theatre, the main entrance, the primary courtyard, circulation spaces and external spaces.